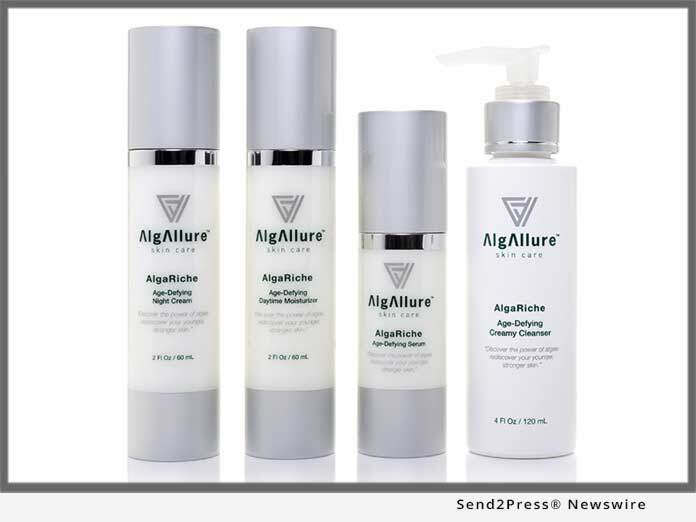 LA GRANGE, Texas, May 18, 2018 (SEND2PRESS NEWSWIRE) — AlgEternal Technologies, LLC, a leading producer of naturally and sustainably produced microalgae-based products has introduced its AlgaRiche(TM) range of AlgAllure(TM) high-performance, luxury age-defying skincare products. The AlgaRiche line is rich with PhycoDerm(TM), a patent-pending, proprietary marine red microalgae extract. AlgaRiche’s product line includes 4 high-performance products: Age-Defying Creamy Cleanser, Age-Defying Serum, Age-Defying Daytime Moisturizer and Age-Defying Night Cream. All four products, which retail between $25 and $90, are designed to be used synergistically to cleanse, balance and rejuvenate skin. “AlgaRiche products naturally liberate and protect skin from the harsh effects of environmental stressors such as sun, wind and pollution. Nature herself engineered PhycoDerm’s ability to recharge skin cells and promote a radiant, more youthful looking complexion. We know it works and trust our customers will be beautifully satisfied,” said Ramjohn.